Is UDF, LDF trying to drag BJP into their Lok Sabha fight? Congress Working Committee member Oommen Chandy claimed that the CPM is making false statements about the UDF by linking the party with the BJP and countered allegations by stating that it is the Communist Party which has been supporting the BJP. Thiruvananthapuram: Did the CPM state secretary Kodiyeri Balakrishnan make a false statement because he was scared of the upcoming Lok Sabha election results? “Yes,” says the UDF. The KPCC has ridiculed the CPM claims stating that the Congress has entered into a secret deal with the BJP in five Lok Sabha seats to defeat the LDF. Congress Working Committee (CWC) member Oommen Chandy also stated that the CPM fears that they will lose the upcoming Lok Sabha election results and are hence making false statements about the UDF by linking them with the BJP. He also said that the UDF had selected the best candidates in all the seats and they are not worried about defeat. Balakrishnan spoke to MyNation and claimed that the BJP is supporting the Congress in five constituencies for mutual benefit. Reacting to his statements, Chandy questioned the absurdity of the statement. “How can the CPM even think that the Congress would support the BJP where Shashi Tharoor is contesting?” Chandy asked. Chandy has made similar statements in the past too. In 2018, Chandy said, “The CPM stood with the Jan Sangh in 1977. In 1989, they supported the BJP. Recently, during the assembly polls in Bihar, the CPM stayed away from the grand alliance and helped the BJP win at least 11 seats. The CPM's anti-BJP stand is just a ploy to gain some votes". Opposition leader Ramesh Chennithala also claimed that the BJP is allied with the CPM in several constituencies. Countering this statement Senior CPM leader, EP Jayarajan said, "The Congress is allied with the BJP in five constituencies; Kannur, Vadakara, Kozhikode, Kollam and Thiruvananthapuram". He also added that Congress is trying to destroy the nation. “The IUML has allied with the RSS in Kerala, and later we can definitely see IUML members resigning and joining the RSS,” said Jayarajan. Meanwhile, KPCC president Mullapally Ramachandran also claimed that the BJP-CPM had a secret pact in the past. He added that Pinarayi Vijayan won from Koothuparamba in 1977 with the help of the BJP, and in return, EMS Namboodiripad, campaigned for BJP strongman KG Marar in Uduma. Attempts to contact BJP leaders, K Surendran and Sreedharan Pillai went in vain as they refused to speak about the issue. However, with allegations and refusals and counter-allegations, the question arises; could this be a ploy by the CPM and Congress to show the BJP in poor light? 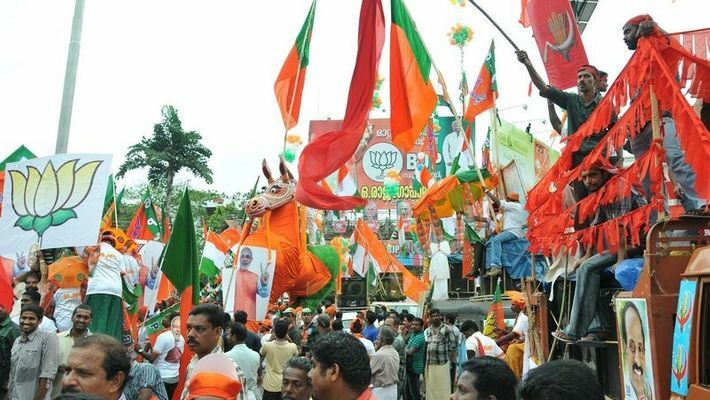 Though the BJP has not won many seats in Kerala, it could fare better this time, due to the prevalence of the anti-incumbency trend and the growing popularity of Narendra Modi. Earlier, Pinarayi Vijayan said he would implement the Supreme Court verdict on Sabarimala allowing the entry of women of all age groups into the famous shrine at any cost. Police arrested three women who tried to enter the Vavar mosque. Many political parties tried to expose Vijayan's “double standard” on the issue. The Congress's “hypocrisy” on the Sabarimala, many allege, also came to light when its own member entered the shrine. The party aimed to gain votes through the Sabarimala issue, but now, every plan has collapsed. During the Lok Sabha election, the BJP may sense an opportunity to double its tally in the state this time around because of the Supreme Court verdict on Sabarimala. The BJP has thus far not changed its stance on the Sabarimala issue, sources say.